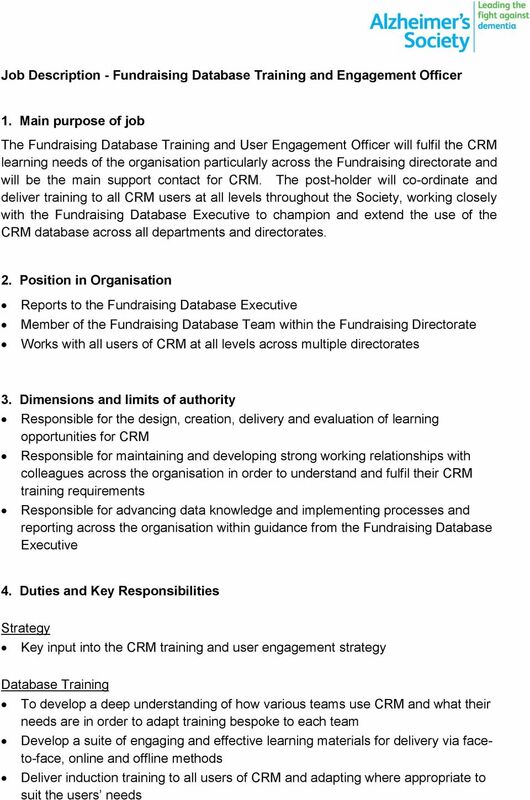 Download "Job Description - Fundraising Database Training and Engagement Officer"
2 Develop and deliver refresher and advanced training to users to ensure continued practise of correct CRM usage Assist the Fundraising Database Executive in developing a strategy to fulfil the organisation s training needs Assist colleagues across the Society in optimising the use of CRM with regard to record-keeping Keep up-to-date with modern training methods and techniques to ensure training is delivered to the maximum effect Ensure that all changes to procedure are updated in training materials User engagement Be the main point of contact for colleagues with regards to the day to day use of the database Develop a strategy to recruit and maintain a CRM Champions programme in various teams to ensure a wide proliferation of best practices Support procedures for regular house-keeping; ensuring data is accurate and complies with the Society s business rules and Data Protection legislation To support users in assessing and developing how best to use the database without creating conflict to existing processes Database Support Assist in devising and implementing best practices for database support procedures Understand the needs of all teams and directorates and advise on proper use of the database To be prepared to stand in for other members of staff to complete day-to-day tasks in the fundraising database team To undertake any other duties or projects commensurate with the nature and grade of this post as required. 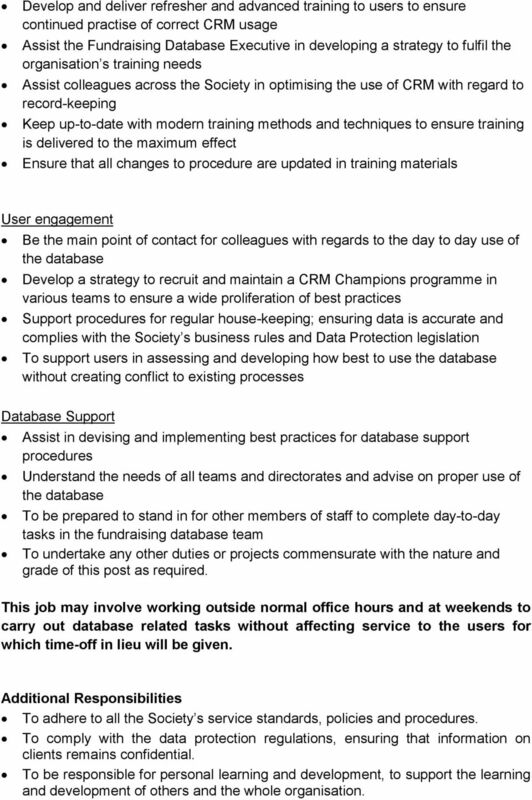 This job may involve working outside normal office hours and at weekends to carry out database related tasks without affecting service to the users for which time-off in lieu will be given. Additional Responsibilities To adhere to all the Society s service standards, policies and procedures. To comply with the data protection regulations, ensuring that information on clients remains confidential. To be responsible for personal learning and development, to support the learning and development of others and the whole organisation. 3 To work in a manner that facilitates inclusion, particularly of people with dementia. To implement the Society s health and safety policy and procedures, ensuring that all practices and procedures are undertaken in accordance with a healthy and safe working environment and that all staff and volunteers for whom you may be responsible are aware of their responsibilities in respect of their role, monitoring data and recommending action as required. To administrate and organise own work to ensure that it is accurate and meets quality targets, reasonable deadlines and reporting requirements. To follow the Society s management information guidelines and requirements, including ensuring appropriate monthly measures on service usage levels are collected and submitted on the services database or other systems in accordance with deadlines. 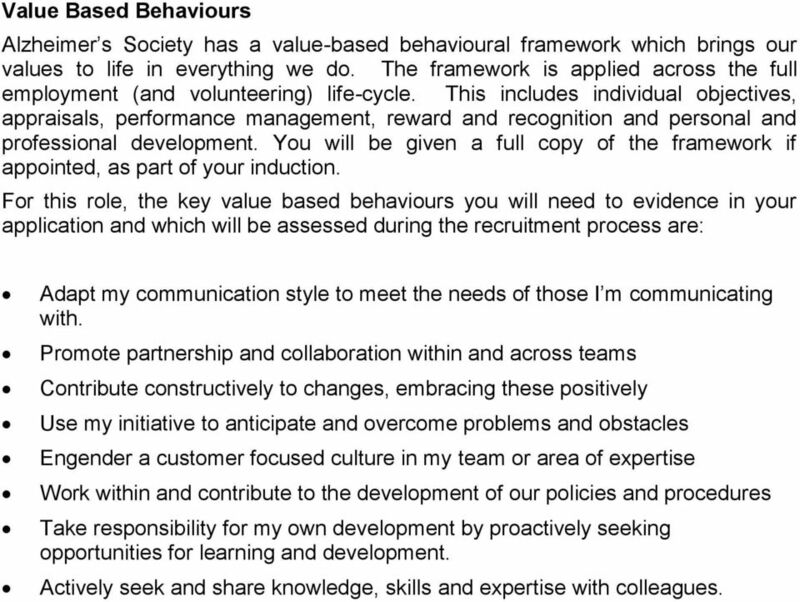 5 Value Based Behaviours Alzheimer s Society has a value-based behavioural framework which brings our values to life in everything we do. The framework is applied across the full employment (and volunteering) life-cycle. This includes individual objectives, appraisals, performance management, reward and recognition and personal and professional development. You will be given a full copy of the framework if appointed, as part of your induction. 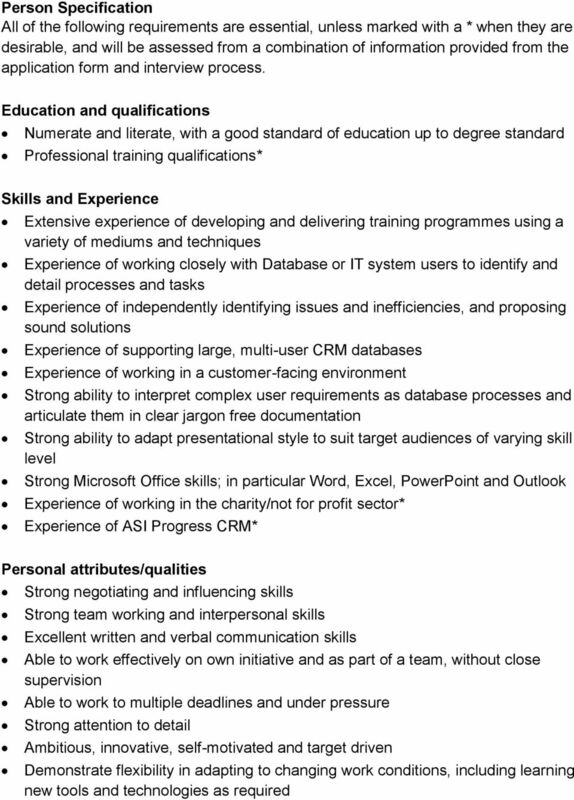 For this role, the key value based behaviours you will need to evidence in your application and which will be assessed during the recruitment process are: Adapt my communication style to meet the needs of those I m communicating with. Promote partnership and collaboration within and across teams Contribute constructively to changes, embracing these positively Use my initiative to anticipate and overcome problems and obstacles Engender a customer focused culture in my team or area of expertise Work within and contribute to the development of our policies and procedures Take responsibility for my own development by proactively seeking opportunities for learning and development. Actively seek and share knowledge, skills and expertise with colleagues. Reports to: To lead on Active Surrey s marketing and communications implementation to effectively get messages to the public, partners and staff. 1. To develop and maintain positive relationships with media agencies, employment agencies, universities, work placement coordinators, etc. JOB PROFILE. Write detailed and compelling item descriptions, take photos and create listings. 3. To manage search engine optimisation to ensure that the College website performs well in search rankings and has a strong online brand presence.